Adding social media to the mix. Should you? Could you? Would you? [tweetmeme]The following is a blog post I wrote for Moonfruit, my recommended sitemaker provider for SME’s or start-ups that have no budget to invest in a website. It’s an introduction to social media for those that are considering it and covers the basics. I Hope it’s useful. It’s been hard to avoid the subject of social media recently. The business, marketing and mainstream press has been full of both positive and negative opinion. It’s even graced the pages of Heat thanks to celebrity Tweeters. But is social media a viable option for business? In my humble opinion, yes. Definitely. There’s been a huge change in behaviour recently. We, the people, have more control over what we read, watch and digest and can choose to connect wherever and whenever we like, either on the move, at home or at the office. Because of this increased connectivity, business and personal lives are much more interlinked and we can tailor how we do things to best suit our needs. We are much less trusting of the old ways of marketing, such as advertising and pr, choosing instead to trust the recommendations of others. Basically, we have more power and social media has been one of the things that has helped us to get it. 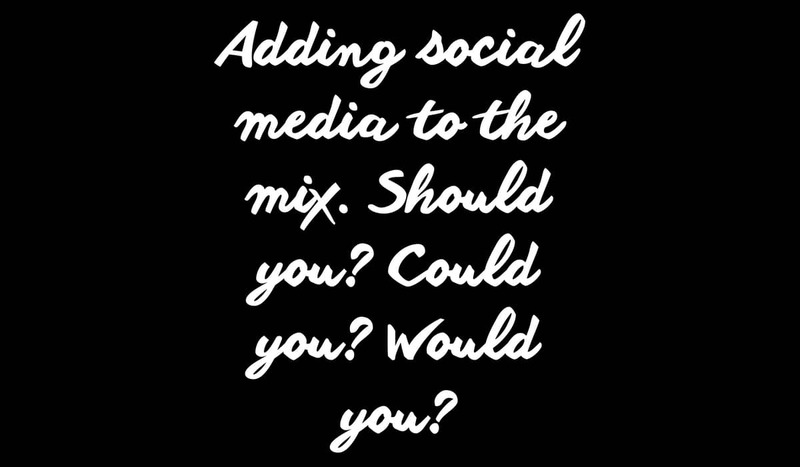 Social media, social networking, web 2.0, social media marketing, social business … whatever you want to call it … is about people connecting, engaging, having conversations and collaborating online. It’s a fundamental shift from traditional marketing methods of talking ‘at’ your audience, to talking ‘with’ them. The old broadcast method just doesn’t work anymore and this new way of communicating allows you to engage with your audience and, more importantly, allows them to engage with you, something that was rarely possible with the old way of doing things. This type of engagement leads to increased participation and creates community which, in turn creates brand advocates and word of mouth. As mentioned earlier, these word of mouth recommendations are what people now choose to base their decisions on and as businesses, we need to make sure we’re the ones being recommended. This includes all types of business: business to consumer or business to business, large corporates or SMEs. 1. Grow your communities and connect. Never underestimate the power of community, as well as becoming brand advocates they are a useful source of rich information. Listen to them, learn from what they’re saying. You’d be surprised just how much insight you can benefit from. 2. Raise brand awareness and establish credibility. By showing you know what you’re talking about, you can establish yourself as a thought leader in your field. Social media can also connect you to key influencers (such as industry leaders, journalists, peers) who can also hep to build reputation. 3. Monitor and manage reputation. There are a number of tools that allow you to track your brand and uncover what people are saying about you online. In the past, these conversations were going on whether you were aware of them or not, but with these new tools you have the ability to find and engage with them by thanking those that speak about you positively and responding to negative comments proactively. These monitoring tools can also be used to uncover what’s being said about your competitors, your clients/customers, potential clients/customers and any conversation around key industry topics. 4. Strengthen PR activity. These days any effective PR strategy should integrate both offline and online activity. Social media helps by boosting the spread of news further and increasing your reach dramatically across the various social media platforms. 5. Customer service tool. Twitter has shown itself to be a great real time customer service tool with brands such as Dell and BT introducing specific customer service profiles that people can connect with and have their support issues dealt with much quicker than the typical telephone model. 6. Improve website or blog search engine optimisation. As you may know, one key factor to a high ranking on Google and the like is the number of links from other websites to yours. By spreading news with links to your site across social media (which can then be repeated through things like retweets on Twitter) you can greatly increase the number of links to your site. This is boosted further if you include keywords in your social media strategy. 7. New business generation. By establishing credibility in your specialist area you can become the ‘go to’ person when people in your community seek your service or product. But, and I can’t stress this enough, never overtly sell! Social media isn’t a place for selling. It’s a place for connecting and engaging. Accept you can’t control the conversation. Understand that social media is more than just a marketing or pr tool. Its a new way of communicating. Once you open the doors to it, you can’t close them. Commit to the long term. Be prepared for the positive and negative. Ensure you have the internal resources to support it and internal buy-in. First and foremost, you need a strategy. Be clear about the objectives. What do you want social media to achieve for your business? Once you understand that think about how you will measure it. Return on investment is a big topic in social media with some saying it’s impossible to measure a conversation and others suggesting it can be measured in the same way as other marketing and pr activities. Consider how you already measure these (because you’re doing that of course aren’t you?) and integrate social media measurement with this. Of course with any type of measurement, it’s difficult to pinpoint exact sources of revenue if you have a few activities running, but looking at things like increased traffic, increase in mentions across the web etc will help you to understand the effect social media is having. By ensuring you measure revenue before the social media program starts and then during, you will get an idea if revenue is affected by these increases in traffic, mentions etc. Find where your audiences are and be there. This might not necessarily mean the most popular platforms as there are niche networking sites that could also be useful. Decide who should be responsible internally, but don’t automatically give it to the intern. This is a role with a certain amount of responsibility, so pick someone that understands your business, has your values running through their veins, someone who is passionate about what you do and who is naturally sociable (that’s half the battle). There could be someone in the company that already ‘gets’ social media and is using it personally. Once you pick the right person, ensure they understand the strategy you’ve developed and what’s expected of them. Develop guidelines so they are clear what messages are acceptable and ensure they are equipped to deal with any negative comments. However, don’t forget you can’t control the conversation so these are purely guidelines, not a script. Social media can be addictive so be clear how much time is acceptable. If it’s an hour a day, make that known. Once you’ve got that little lot done, don’t dive in. Start by finding who you want to connect with and listen. This is a core skill when it comes to social media, so listen to what people are talking about and how they are engaging. Ease yourself gently into conversations and be authentic and transparent. People want to connect with people, so let both the brand personality and the person shine through. It takes time to build a community so be prepared for it to take a while to establish relationships. Social media really is a marathon, not a sprint so don’t expect any quick fixes. Finally, when thinking about your content try to get a good mix of your own thoughts, opinion and news mixed with those of others. Feel free to share useful content you’ve found on the web, think about what your audience will be genuinely interested in and give them that. Also make sure there’s a good mixture of sharing/retweeting and responding to others. Remember, it’s a conversation. Hopefully that has given you some food for social media thought, but if you have any other questions, get in touch. I’m very sociable.